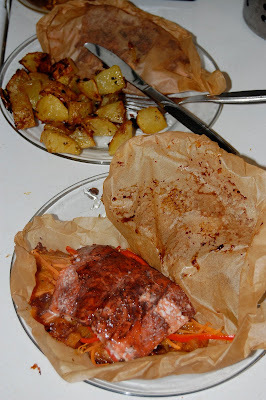 Seriously, en papillote is one of my favorite ways to make fish. And it's so, so easy. Much easier than it sounds. Tonight, before the fiance and I leave for Valentine's Day to his cabin in central Idaho (near Salmon), where there is no internet and no cell service, I made something that I knew would appeal to both him and me. This is a bit on the complicated side, but the gist of it is using a technique you're comfortable with (or getting comfortable with), with whatever ingredients you have on hand. I started with about five medium-sized Yukon Gold potatoes, cut into approximately 1-inch cubes. I later decided that I should have cut the potatoes into smaller pieces; it would have created a better mixture of crispy edges and soft centers. Into a small Cuisinart blender went two large sprigs of rosemary, stripped off their stems, with almost an entire head of roasted garlic. I added about half a cup of olive oil, and 1/3 to 1/2 cup of white wine. I pureed that all together until the rosemary was less than half a centimeter long in its largest pieces. I used about half this sauce on the potatoes, and the rest went into reserve for a future dish. Once the sauce was blended, I tossed the potatoes in it, and set those aside in a large baking pan -- large enough that each piece of potato was touching the bottom of the pan. This went into a 425 oven for about 20-30 minutes until I was finished preparing the fish (and watching parts of the Olympic opening ceremonies). I turned the potatoes about halfway between placing them in the oven and adding the fish to the oven. Separately, I added to the small Cuisinart blender the two halves of a medium-sized acorn squash from Idaho's Bounty that I cooked almost a week ago. That had been merely halved, filled with butter, brown sugar and a little salt, pepper and chili powder, and baked until soft. In addition to the squash filling, I added about one canned chipotle pepper (hard to tell, since once they're canned they break apart). This is important -- it gave the final product much of its bite. I bought two pieces of salmon that were cut from about 2/3 down the length of the fish towards its tail. By buying two pieces that were approximately the same width (2-3 inches) and same thickness, I ensured that the fish would cook approximately evenly throughout the en papillote process. I believe they were previously frozen Atlantic salmon. Certainly not my favorite, but what's available in the middle of February in Idaho, and better than some of the alternatives. 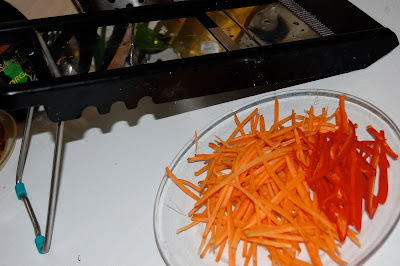 Using my madeline (a really, really fun tool, and not too expensive -- I'd recommend the investment if you have the space), I julienned two smallish sweet carrots from Idaho's Bounty, and then hand-julienned two red jalapeno peppers from Albertson's. I'd never seen red jalapenos before, which is why I sprang for them instead of some other hot pepper. 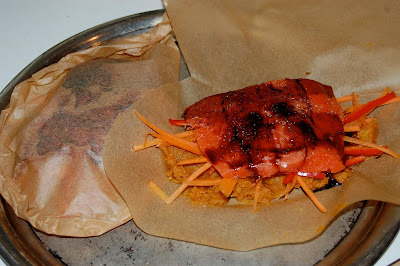 Cutting the parchment paper into hearts, per Epicurious, I began with a layer of the squash-chipotle mixture, then topped that with the julienned carrot-jalapeno mixture, and placed the fish on top of all that. I sprinkled the fish with fresh-ground black pepper, fresh-ground sea salt, and drizzles of a red wine reduction (half a bottle of red wine simmered until it was about half a cup). Winding the parchment paper into packets, I put them on a baking sheet and popped them in the oven. (And yes, I realize that in the middle picture up there, my drizzling of the red wine reduction created something halfway between a Roswell-esque alien and a cartoon character. Totally unintentional, I assure you). Until they came out of the oven after 15 minutes, I didn't realize that I hadn't boosted the oven from 425 to 475, which I should have. Good thing I tested my piece of salmon, and put the packets back in the oven for another 10 minutes, because when I took them out first, they were underdone. Properly, the re-ovening should have been closer to 6 minutes, because by the time the packets were done, the thinnest ends of the pieces of fish were rather too dry. Still good though, and the middles were beautifully self-steamed. My favorite bits of the finished dish were the potatoes, which despite being too thick had some gorgeous crispiness on the edges, and the underbase of the salmon (the squash/carrot/jalepeno). It verged on being too spicy, but only *just* not too much for my palate (which was tragically blanded by four years at boarding school). For an accompanying beverage, I went with a Moscatto (a cheap one, to be sure, as I cannot afford luxury sparkling wines), which was beautifully sweet and bubbly atop the spicy thickness of the main dish. Highly recommended pairing. oh I've never had anything like this but it looks incredible! Hmmm -- sounds like a luscious way to spend a Sunday afternoon.